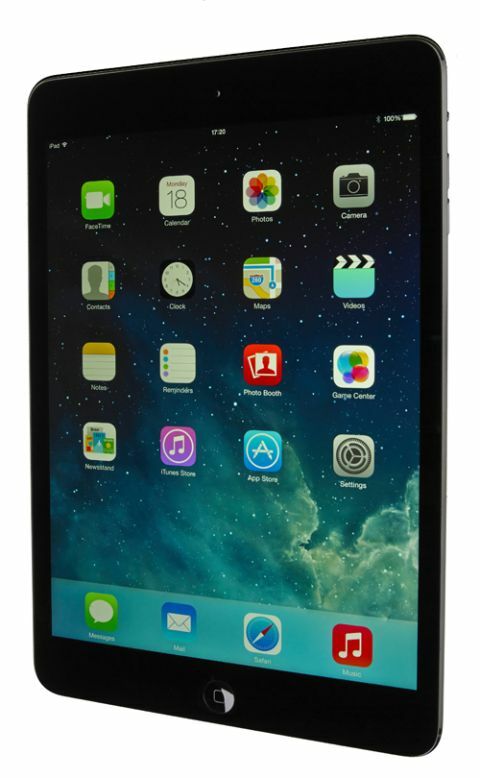 Apple iPad Mini 2 with Retina display review | What Hi-Fi? The iPad Mini 2 with Retina Display is the iPad Mini we always wanted. We really liked last year’s original model, but it always felt like the underpowered, under-specced smaller sibling to the full iPad. Now all that separates the two is size, and that makes for quite the pint-sized proposition. The big change for the new, second-generation Mini is right there in its name – the 7.9in display has been bumped from 1024 x 768 pixels to a 2,048 x 1,536 Retina display, the same resolution as the new iPad Air. The result is nothing short of stunning. The screen is bright and sharp, with text and icons well etched and with not an identifiable pixel in sight. Colours are rich but natural, and the only thing that will cause pictures to look anything less than crystal-clear is their original resolution. Feed the iPad Mini 2 high-quality images and it will shine, reproducing them with absolute crispness, accuracy and stacks of detail. Last year’s iPad Mini seems quite pedestrian now: text looks fuzzy, images are poorly defined and there’s an overall lack detail compared with the new model. We’d never had a problem with last year’s screen before, but to go back now would be almost impossible. All the benefits of the new screen feed through to video performance, of course, which is another triumph for the tablet. Detail is second to none, outlines are well defined and there’s a sense of depth here that you don’t see on lesser tablets. Bright white stars punch through a velvety black night sky without compromise on either end of the scale, and there’s a subtlety to colour reproduction that means the Mini demonstrates a wider, more considered colour palette than many of its rivals. Shadow detail is good too, so you don’t lose anything from an image when the Mini does have to reach down to inkier depths. It’s hands-down the best video performance we’ve seen on a sub-8in tablet. You could easily lose hours to watching video on this thing, and the Mini’s screen size feels a more natural fit than its 7in rivals. We’ve always liked how Apple’s portables sound, and the iPad Mini with Retina Display is no different. It’s clean, refined and well organised, with the same crispness of its video performance pulled through to its dealings with music. It doesn’t quite beat the iPad Air for the ultimate in tablet listening, but it’s not far off – it does a great job with rhythms and dynamics, and isn’t scared to go quiet when the music demands. Instruments have their place in the music and vocals are direct and expressive – Apple has spent time on this sound, and it shows. Even out loud, the sound from the iPad Mini’s stereo speakers is great and beats the tinny, restrained sound on most of its rivals. It sounds accurate and balanced, and there’s no sense of distortion when it’s pushed louder. It certainly does the job for headphones-free playback. This is all backed up by really speedy performance. The new iPad Mini uses the new A7 and M7 co-processor that we’ve seen in the iPad Air and iPhone 5s. Menu swipes are buttery-smooth, apps open quickly and web pages load swiftly. Even graphics-heavy games run without a hitch. We did have a small handful of unexpected crashes during testing, but that’s just a small flaw in an otherwise very fast, stable experience. The iPad Mini feels very much like its predecessor, with its slim body, curved edges and aluminium case making it as wonderful to hold as ever. It’s actually slightly heavier and thicker than the original, but you’d never notice in day-to-day use. The casing colours, as with the iPhone 5s, have been changed to a choice of silver or space-grey. Our grey version has fared well cover-free during testing, with no obvious scuffs or scratches to speak of. It’s the easily the nicest design we’ve seen on a sub-8in tablet. It’s a premium thing. That feeling extends even to the handful of physical buttons along its right and top edges. They feel solid, well made and nice to use – there’s an attention to detail here that not all of the Mini’s rivals can match. If you’re going to use the iPad Mini 2 for snapping photos, it offers more promising results than many other tablets – though the size and shape aren’t exactly ideal for photography. Apple agrees, it would seem, since it has kept the same 5-megapixel iSight camera from its predecessor, instead of bumping it up the 8MP snapper from the iPhone 5s. Still, in good light, pictures appear crisp and detailed, and even indoors it performs admirably under the harsh strip lighting of the What Hi-Fi? Sound and Vision offices. Colours are well judged and realistic on the whole (if on the cooler side of neutral), with whites remaining bright without being overblown. Blacks could be deeper though, particularly in our indoor shots. Apps remain a strong point for any iOS device, and tablets in particular, with over 475,000 tablet-optimised apps available. Android doesn’t come close to that. Many of the apps on Google Play are just blown-up versions of the one you’d use on a phone – even mainstays like Facebook and Twitter. Having apps made for the tablet experience is more of an advantage than it might sound. Of course, as we know only too well with Apple products, there’s a price to pay for all of this. At £320 for the 16GB wi-fi only version (the Mini now goes up to as much as a £660 for the new 128GB 4G version), it’s quite a lot pricier than its main competition – the Nexus 7 at £200 – which will make a lot of people’s minds up for them. That said, with this screen and performance, not to mention the app advantage over Android rivals, it’s pretty hard to fault the iPad Mini. It’s the best sub-8in tablet on the market.